The perfect way to spend a cold, snowy afternoon is with a delicious bowl of hot soup and the Fenwick Lioness provided the perfect soup last Sunday. With Niagara under a cold weather alert and most of Pelham still digging out from under our first snowfall of the year, the Lioness were offering up five varieties of homemade soup, complete with fresh bread and homemade desserts. Soups On convenor and Fenwick Lioness Vice President Heather Soares explains the fundraiser features a variety of soups made by the Lioness members and no two Soup’s On events offer the same five kinds of soup, noting she is always on the lookout for new soup recipes. Sunday’s fare included Cream of Broccoli, Lasagna Soup, and Corn Chowder. Attendees can try every soup on the menu or as much as they’d like of their favouite soup, she adds. “It’s really good,” says Baileigh on why she likes attending the event so much, adding there are always different kinds of soups. “You get to try new things,” adds her sister Caitlynn, eating a bowl of Cream of Broccoli soup which she says is her favourite. Soares and Lioness member Darlene Raymond say their customers usually let them know which soups they like a lot and which they’re not so keen on—although no one has ever said a particular soup is not good at all. A pot of Portuguese Red Bean Soup at last month’s event was a favourite and many people asked for the recipe, says Soares. Raymond added the cream soups—Potato, Mushroom and Broccoli— seem to be the most popular. Soares plans the menu based on what’s on sale or new recipes she’s found, then she buys all of the ingredients in Fonthill, sure to support local businesses, before the Lioness members gather on Saturday to cook the soups for the next day’s event. Beamer, who suggested the local club try the soup fundraiser after seeing it done at another Lioness Club, says they have a good variety of soups, the members all get along and all cook together, and they have the support of the community. “We’re in a small community. That’s the difference,” she says on how they’ve built a regular customer base over the past five or six years they’ve been holding Soup’s On. Both Soares and Beamer noted the soup fundraiser was a good idea for Fenwick because it didn’t replicate other fundraisers in the community, like a pasta dinner. The funds raised by the soup event—last year about $1,800 over the entire season—are used to fund community projects and organizations, says Soares, noting the Lioness continue to fundraise to provide Dog Guides as their major project. Each year the club gets requests from the community and they decide where, and how much, they will donate. At the end of the year, if there are funds left over, the Lioness will make donations to other projects or charities, last year supporting Lions camps. The Lioness have built up a regular following for the event, says Soares, explaining the turnout, and the funds they are able to raise, has grown over the years. Next month’s soups will be “back to basics,” says Soares, and will feature soups like Chicken Noodle, Cream of Tomato and Cream of Mushroom. The Fenwick Lioness hold five Soup’s On events each season, monthly between November and March. 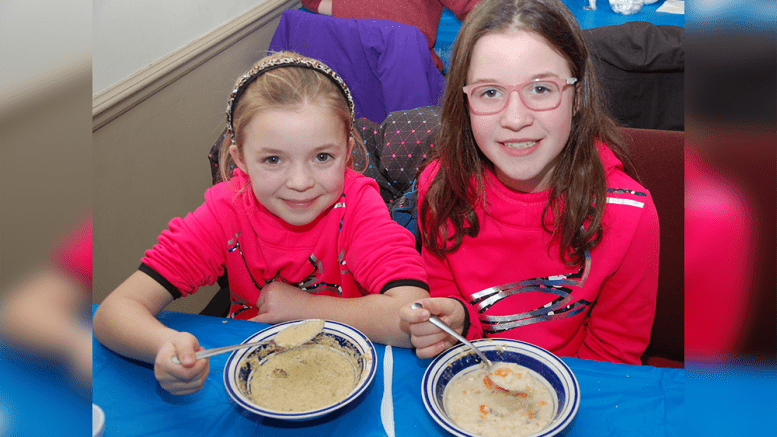 The next Soup’s On event will be February 17 at the Lions Club in Fenwick. Cost is $10 for adults, $3 for kids.